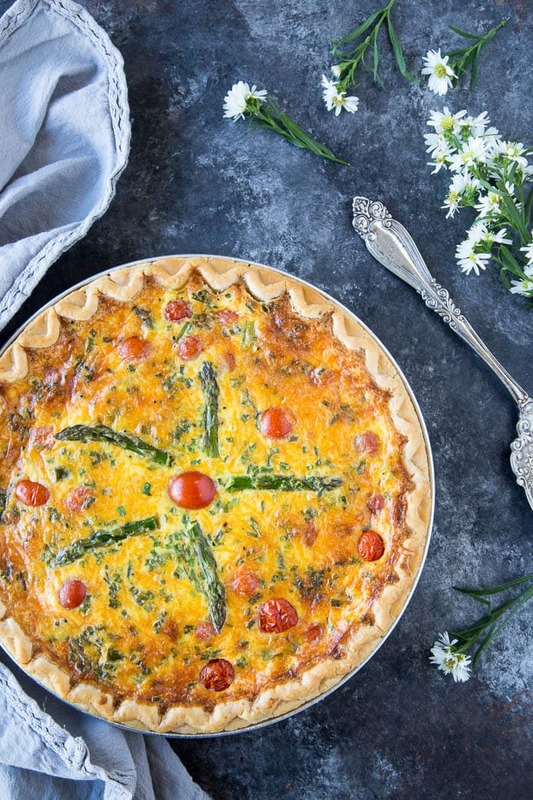 Asparagus, Tomato & Cheddar Quiche- A quick and easy quiche recipe for the “non-baker” or for when you want a fancy and impressive company worthy meal with only about 10 minutes prep time. Perfect for breakfast, brunch, lunch or dinner. Add crispy bacon or ham for an extra burst of savory flavor. Q U I C H E ! Oh that perfectly silky custard-like filling and flakey crust that makes a quiche so fabulous! 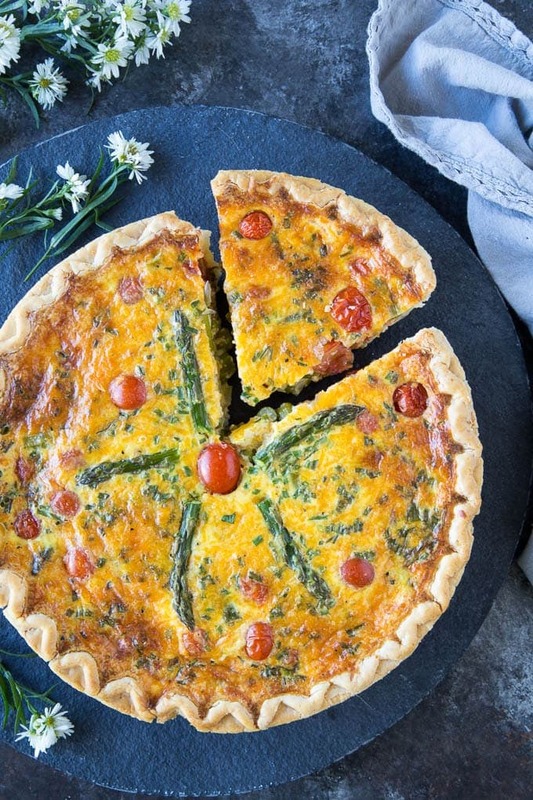 This vegetarian version is filled with creamy cheddar cheese, fresh asparagus, tomatoes, chives and a dash of spices. Feel free to add crispy bacon or diced ham if you’re so inclined. Making quiche used to seem a bit daunting to me… baking is not really my thing and the thought of rolling out dough and making a pie crust was just enough to put me off. That is until I decided to scrap making my own pie crust and just use a pre-baked frozen version. Game changer! Using store-bought pie crust means it’s possible to whip up a perfect quiche anytime. Sure, in a perfect world I’d love to take the time to learn how to make a pie crust and bake a quiche from scratch but that just doesn’t fit into my already CRAZY time schedule…so pre-made store-bought crust it is! Bonus: Only 10 minutes prep time to get this delicious quiche into the oven. 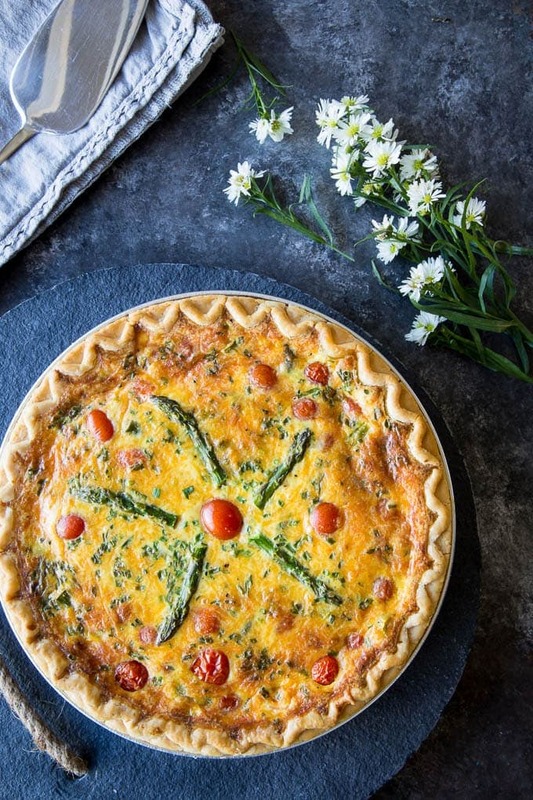 Quiches are so versatile! You can basically serve them for any meal! They make the perfect breakfast or brunch entrée, light lunch or dinner meal option. My go-to quick breakfast option has usually been egg muffins of some sort ( like these Mediterranean Omelet Cups) that I can whip up over the weekend and have for the week ahead but lately I’ve been making a quiche on the weekend and having a slice for breakfast throughout the week. I feel so FANCY! And truth be told the quiche is just as easy to make as the egg muffins! If you’re planning on reheating your cooked quiche there are a few steps you want to make sure you follow after baking to insure the quiche reheats well. After baking quiche allow it to cool completely ( on a wire rack) before covering with plastic wrap. ( Covering it while the quiche is still warm could cause condensation to form = soggy crust). Refrigerate until ready to serve. Remove plastic wrap and cover with aluminum foil- bake for 8-10 minutes or until warm throughout. If warming up just one slice of quiche- wrap slice in foil and bake for 8-10 minutes. A quick and easy quiche recipe for the “non-baker” or for when you want a fancy and impressive company worthy meal with only about 10 minutes prep time. Perfect for breakfast, brunch, lunch or dinner. Preheat oven to 375° F. Pierce pie crust with a fork several times. In a large skillet over medium-high heat add butter. When butter is melted add onion and garlic and cook 1-2 minutes until onions soften ( but aren’t browned). Add asparagus and tomatoes and cook for approx. 5 mins. until asparagus begins to soften. Place mixture in a bowl and allow to cool. In a large bowl add eggs, half and half, chives, Dijon, nutmeg and cayenne. Whisk until well combined. If you’re planning on reheating your cooked quiche there are a few steps you want to make sure you follow after baking to ensure the quiche reheats well. 1.After baking quiche allow it to cool completely ( on a wire rack) before covering with plastic wrap. ( Covering it while the quiche is still warm could cause condensation to form = soggy crust). Refrigerate until ready to serve. 3.Remove plastic wrap and cover with aluminum foil- bake for 8-10 minutes or until warm throughout. Hi Susan! What would you substitute if you left out the cheddar cheese? Looks yummy!